Each April when my parents' pool guys peel back the cover and reveal a sparkling blue oasis, it's hard to imagine waiting another month to dive in. My kids found an easy fix for this over this weekend. 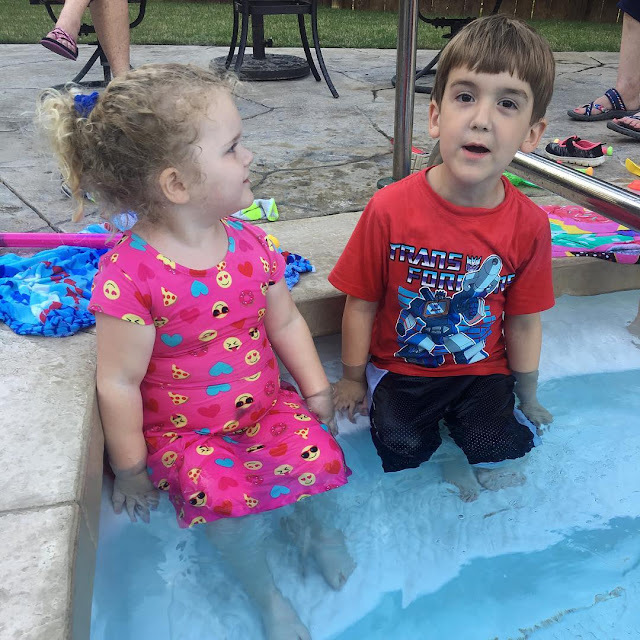 Usually my "first dip in the pool" photos are snapped around Memorial Day, but they decided Easter Eve was good enough. It may have been 80 degrees in the air, but that water had not seen sun since October and the temperature hovered at a much cooler mark. Before we arrived at my parents' house, I knew they would want to swing or fine-tune their egg hunting skills, so I reminded them not to run by the pool, play by the pool, and or really look in the pool's general direction. I wasn't swimming in April. Eventually my nervousness subsided and I let them dip a toe in to test the frigid waters. They assured me it wasn't too cold, and I had flashbacks of my my brother and I bobbing around the shallow end in early spring with chatters of "...this feels great!" on our blue lips. I redirected their attention and went inside to visit/linger at the appetizer table. Every so often I peeked outside and saw three sets of feet standing on the first step, loading their squirt guns. Harmless enough, right? I warned them: "Don't get in that pool!" They reassured me: "We won't!" This doesn't technically count as the first swim of the year because no one was actually swimming. I did, however, have to peel wet clothes off the two smaller ones who failed to remember they weren't in swimsuits. We are beginning to close in on summer, but we still have several weeks to go. Sometimes it's just hard to wait, isn't it? Happy Hump Day, y'all. Listen to your moms!